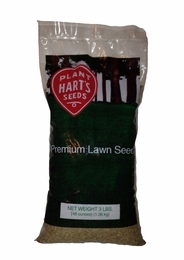 Wear N Tear is Hart's most popular mixture of fine bladed, turf-type, perennial grasses for full sun to light shade. Kentucky Bluegrass (35%), Creeping Red Fescue (35%) and Perennial Ryegrass (30%). This blend forms a beautiful, uniform lawn and is often used for athletic fields. Performs best with some regular maintenance and fertilization. This is the choice for most homeowners who love their lawns and have a mixture of areas to deal with. Open ground seeding rate: 5 pounds per1,000 square feet. One half rate for over seeding.